jennie's nails and tales: It's a De-lf! Okay, I've mentioned previously that I believe New Brunswick is the Texas of Canada because things are BIGGER here. Most notably, the WILDLIFE. Well yesterday The Hubby and I decided to take a trip to The Happiest Place On Earth Costco. We haven't been to one since we moved here. It was a beautiful day so we hopped into the car and and off we went. The warehouse itself was super fun to walk around in, and watching some random dude get checked out by paramedics in the lobby also added a certain je ne sais quoi to our outing. One ceiling fan, a two pack of Bourskin cheese and a giant bag of Jelly Belly Beans later, we were loading the car. Yes, you heard me. DOUBLE PACK OF BOURSKIN! It was like buy one for regular price, get the other for a DOLLAR!! Then, they had packs of bake-your-own baguettes for less than $3...but there's EIGHT of them!!! but THAT's not the point of THIS post. No, no. On the way home from shopping, while eating a giant sour key (if I'm being specific) I saw my first moose. It was ENORMOUS!! It was almost as high as the fence that runs alongside the highway (it's a moose/deer fence) and that's including the FOUR FOOT HIGH snowbank it was standing in. It was relaxed and eating something and didn't try to ram us...thank goodness. I've lived in fear of moose-attacks on the highways here because there are tonnes of FLASHING SIGNS that say The Moose are EVERYWHERE. For reals. The signs are yellow with two orange flashing lights and they give me major anxiety. 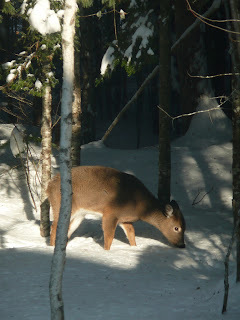 All the moose-sighting madness reminded me about the strange deer visitors we had earlier in the week. 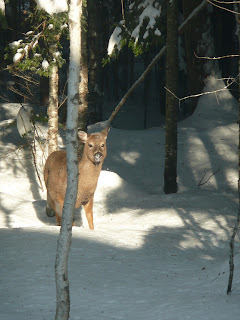 My Dad and Stepmom were the official first visitors we had who've seen deer -- it was very exciting. The closer I looked though, the bigger the deer became. Just for comparison purposes, I've included photos of the new deer we saw a couple of days ago and the deer who hang with us in the summer. Talk about a winter coat! 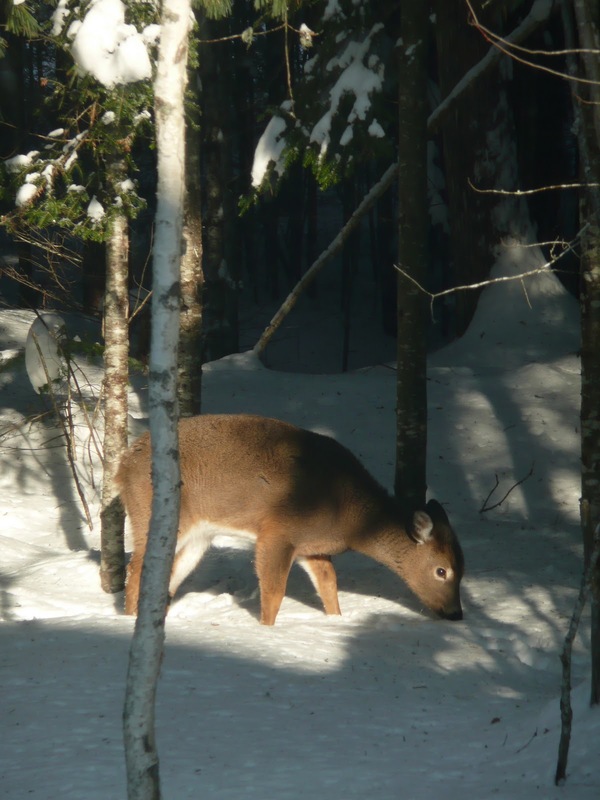 The winter deer looks like a fuzzy guy who likes to cuddle while the summer deer had huge ears. When Winter Deer looked right at me, I swear, it was like a wolf's head was somehow superimposed onto Winter Deer's body. Come ON!!! Look at the face!! That's totally some new kind of deer breed. It's a Delf: part deer, part wolf. An interesting mix considering wolves eat deer, but crazy things happen in the wild. All right, so OBVIOUSLY I'm aware that such a hybrid doesn't exist, but that Winter Deer sure got me thinking. I hope they come back around, it's very peaceful to watch them wander around the property...until The Pickle realizes what's going on and starts going bezerko. That guy's five pounds of pure torque...Oh Pickle, just SHUT IT! We almost got a Costco here!! !....but didn't. So disappointing. How I long for giant sour keys. And oh my god, that totally looks like a Delf!! I can't believe you've only recently seen your first moose! Ridiculous. We used to have moose in our backyard. But they're scary. And someone brought raw moose meat to a fondue party I had once, so I'm kinda terrified. And I totally know what you're talking about with the giant flashing moose signs....they have them here too. I always wonder if people will end up hitting moose on the highway because they're too busy reading the signs....hmmmmm.